The English bulldog, a typically brachycephalic dog breed, may suffer from brachycephalic syndrome. Brachycephalic syndrome is a pathological condition affecting short nosed dogs and cats which can lead to severe respiratory distress. There are four different anatomical abnormalities that contribute to the disease, all of which occur more commonly in brachycephalic breeds: an elongated soft palate, stenotic nares, a hypoplastic trachea, and everted laryngeal saccules (a condition which occurs secondarily to the other abnormalities). Because all of these components make it more difficult to breathe, in situations of exercise, stress, or heat, an animal with these abnormalities may be unable to take deep or fast enough breaths to blow off carbon dioxide. This leads to distress and further increases respiratory rate and heart rate, creating a vicious circle that can quickly lead to a life-threatening situation. Dogs experiencing a crisis situation due to brachycephalic syndrome typically benefit from oxygen, cool temperatures, sedatives, and in some cases more advanced medical intervention including intubation. 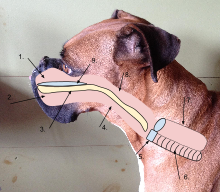 This diagram illustrates what the airway structure looks like in a brachycephalic dog; in this case, a Boxer. The brachycephalic dog has a shorter snout which causes the airway to be shorter, that means all the parts that make up the airway get pushed closer together. Due to this phenomenon, a brachycephalic dog has an elongated soft palate which can cause most of the problems with the dogs breathing. They can also have problems getting enough air in because of their elongated soft palate and shorter airway. Muzzle length scales with the risks of brachycephalic syndrome. Other risk factors identified include neck girth and body condition score. Exercise, stress and heat intolerance. Symptoms progress with age and typically become severe by 12 months. Despite observing clinical signs of airway obstructions, some owners of brachycephalic breeds may perceive them as normal for the breed, and may not seek veterinary intervention until a particularly severe attack happens. After awaking from surgery, most dogs that are intubated will try to claw out their tracheal tube. But brachycephalic dogs often seem quite happy to leave it in place as it gives them an open/bigger airway. Swollen/everted laryngeal saccules which further reduce airway. Collapsed larynx. Increased lung workload causes chronic obstructive pulmonary disease. Stenotic nares in a Boxer before (left) and after (right) surgery. Surgery for widening nostrils, removing excess tissue for elongated soft palate, removing everted laryngael saccules. Early treatment prevents secondary conditions. Potential complications including hemorrhages, pain, and inflammation, during and after surgery make some veterinarians hesitant to perform soft palate correction surgery. With CO2 surgical lasers, these complications are greatly diminished. To prevent or limit exacerbation of symptoms, avoid stress and high heated climates. Maintain ideal body weight (14 to 18 pounds), avoid overfeeding. Use harnesses instead of collars to avoid pressure on trachea. Brachycephalic dogs are more likely to die during air travel and have been banned by many airlines. The risk of brachycephalic syndrome increases as the muzzle becomes shorter. To avoid producing affected dogs, breeders may choose to breed for more moderate features rather than for extremely short or flat faces. Dogs with breathing difficulties, or at least those serious enough to require surgery, should not be used for breeding. Removing all affected animals from the breeding pool may cause some breeds to be unsustainable and outcrossing to non-brachycephalic breeds might be necessary. Malocclusion - misalignment of the teeth. Nasal fold trichiasis - fur around the nose fold rubs against the eye. Distichiasis - abnormally placed eyelashes rubs against the eye. Breeds with less extreme brachycephalia, such as the Boxer, have less compromised thermoregulation and thus are more tolerant of vigorous exercise and heat. ^ a b "Short Muzzle; Short Of Breath? An Investigation Of The Effect Of Conformation On The Risk Of Brachycephalic Obstructive Airway Syndrome (BOAS) In Domestic Dogs" (PDF). UFAW International Animal Welfare Science Symposium: Science in the Service of Animal Welfare: Priorities around the world. 4–5 July 2013. Retrieved 21 January 2018. ^ a b Roedler, F.; Pohl, S.; Oechtering, G. U. (2013). "How does severe brachycephaly affect dog's lives? Results of a structured preoperative owner questionnaire". The Veterinary Journal. doi:10.1016/j.tvjl.2013.09.009. ^ "Worrying numbers of "short-nosed" dog owners do not believe their pets to have breathing problems, despite observing severe clinical signs". The Royal Veterinary College. 10 May 2012. Retrieved 29 June 2013. ^ Packer, R. M. A.; Hendricks, A.; Burn, C. C. (2012). "Do dog owners perceive the clinical signs related to conformational inherited disorders as 'normal' for the breed? A potential constraint to improving canine welfare". Animal Welfare. 21: 81. doi:10.7120/096272812X13345905673809. ^ Johnson, Tony. "Breathless: Bulldogs, pugs need protection from the heat". Veterinary Information Network. Retrieved 17 November 2013. ^ Arza, Ray (2016-09-29). "Elongated soft palate resection with a CO2 surgical laser". Aesculight. Retrieved 2017-02-06. ^ "Air Travel and Short-Nosed Dogs FAQ". American Veterinary Medical Association. Retrieved 5 November 2013. ^ Haughney, Christine (6 October 2011). "Banned by Many Airlines, These Bulldogs Fly Private". New York Times. Retrieved 5 November 2013. ^ "Brachycephalic syndrome". Canine Inherited Disorders Database. Archived from the original on 7 September 2013. Retrieved 5 November 2013. ^ a b "Shih Tzu: Brachycephalic Ocular Syndrome". Universities Federation for Animal Welfare. 2011. Retrieved 2017-11-25. ^ Poncet, C. M.; Dupre, G. P.; Freiche, V. G.; Estrada, M. M.; Poubanne, Y. A.; Bouvy, B. M. (2005). "Prevalence of gastrointestinal tract lesions in 73 brachycephalic dogs with upper respiratory syndrome". The Journal of small animal practice. 46 (6): 273–279. doi:10.1111/j.1748-5827.2005.tb00320.x. PMID 15971897. ^ a b c d e f g h Packer, RM; Hendricks, A; Tivers, MS; Burn, CC (2015). "Impact of facial conformation on canine health: Brachycephalic obstructive airway syndrome". PLoS ONE. 10 (10): e0137496. doi:10.1371/journal.pone.0137496. PMC 4624979. PMID 26509577.